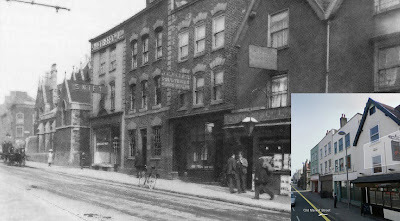 Mr Chris was looking at some pictures and came across this one of our street from 1906. You can see the comparison from the street view pic in the corner. Our building is the one with the poultry sign on. You can see a new street light on the new pic, that only went up about a year ago. It is very bright in Mr Paul's window at night. Surely the most noteable thing about the original pic is that an invisible man is cycling past your place. Spooky goings on in ye Olde Market! Thats really nice. It still seems to be in all the same relative place. Aw man, look at that old gas lamp! I love photos of towns/streets, any era. So interesting! How can you tell it's a poulty sign!? It is pretty much the same yeah, just rendered over the nice brick work! I wonder if the render was stripped off the front of the building it would reveal the stone work above the windows. Looks like 'POULTERER' to me. So it's haunted by the ghosts of dead chickens? If I'd known that at the time I'd have thought twice about working late! I think we should get a chisel out Mr Paul waddya reckon? Now I am worried about staying late Mr Dave thanks for that. Mr Chris is in fact the Google King.